Choose the Milwaukee<sup></sup> Diamond Plus Hole Saw for up to 10X longer life when cutting tile, stone and glass. Diamond Plus Hole Saws deliver best-in-class performance, with higher grade diamonds for maximum heat and fracture resistance. An improved braze provides superior diamond retention when cutting hard, abrasive materials. The One-Piece Hole Saw has a 1/4" quick change hex shank and features a large slug ejection slot. Designed as the single cutting solution for all tile, stone, and glass applications, Diamond Plus offers the lowest cost-per-hole on the market. The Milwaukee Ice Hardened Hole Saw utilizes a proprietary cryogenic hardening process that improves upon the traditional heat treat processes. Unlike surface coatings that wear away, cryogenics harden to the core by minimizing soft metal (austenite) and creating more hard metal (martensite). The result is a product that is consistently hard throughout, resulting in life up to 50% longer than the competition. Designed with a robust < inch quick change hex shank, Milwaukee Shockwave Impact Duty Thin Wall Hole Saws give professionals a hole making solution to use with impact drivers. Utilizing a thin wall, 8 TPI design, Thin Wall Hole Saws deliver a burr-free cut up to 40% faster than standard bi-metal hole saws. The included ejection spring removes the frustration of manually removing slugs by automatically ejecting the material. A stop shoulder design prevents over-drilling into material and potentially damaging inner components of electrical and junction boxes. Choose Thin Wall Hole Saws for use in plastics and thin gauge metals up to 1/8 inch thick. The Milwaukee Hole Dozer Bi-Metal Hole Saw features Rip Guard, an exceptionally strong tooth form backed by the Rip Guard Limited Lifetime Tooth Break Warranty. Each tooth is built with extra steel behind the cutting edge for added strength. This enhanced strength along with 8% cobalt help extend the life of the teeth, allowing for increased productivity on the job site as well as continued hole quality. The Hole Dozer also includes Plug Jack, an all-access slot design that allows for full access during plug removal. This provides access lower into the cup for thick material and higher towards the teeth for thin material. With multiple positions to apply leverage and better plug access, Plug Jack improves productivity and eliminates wasted downtime between holes. Designed with a robust quick change hex shank, Milwaukee Shockwave Impact Duty Thin Wall Hole Saws give professionals a hole making solution to use with impact drivers. Utilizing a thin wall, 8 TPI design, Thin Wall Hole Saws deliver a burr-free cut up to 40% faster than standard bi-metal hole saws. The included ejection spring removes the frustration of manually removing slugs by automatically ejecting the material. A stop shoulder design prevents over-drilling into material and potentially damaging inner components of electrical and junction boxes. Choose Thin Wall Hole Saws for use in plastics and thin gauge metals up to 1/8 thick. 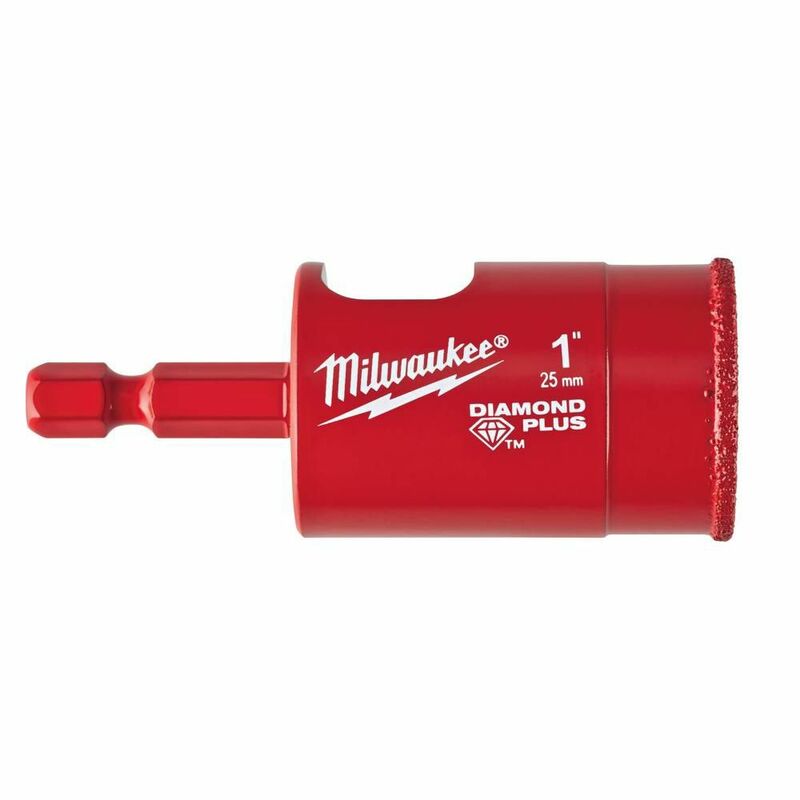 1 Inch Diamond Plus Hole Saw Choose the Milwaukee<sup></sup> Diamond Plus Hole Saw for up to 10X longer life when cutting tile, stone and glass. Diamond Plus Hole Saws deliver best-in-class performance, with higher grade diamonds for maximum heat and fracture resistance. An improved braze provides superior diamond retention when cutting hard, abrasive materials. The One-Piece Hole Saw has a 1/4" quick change hex shank and features a large slug ejection slot. Designed as the single cutting solution for all tile, stone, and glass applications, Diamond Plus offers the lowest cost-per-hole on the market. 1 Inch Diamond Plus Hole Saw is rated 4.3 out of 5 by 105. Rated 5 out of 5 by HomeDepotCustomer from Perfect for a home project of cutting holes in clay... Perfect for a home project of cutting holes in clay pots. Worked great! Be sure to spray pots with water for drilling. Rated 5 out of 5 by Egl from I bought it to drill drain holes in a large... I bought it to drill drain holes in a large clay pottery. It worked perfectly, didn't crack or damage the pottery at all. pretty happy with the results. Rated 4 out of 5 by JD from Worked well. Just needed it for a few holes through... Worked well. Just needed it for a few holes through some stone. Rated 5 out of 5 by Ken from The bit did what it was supposed to do, quick... The bit did what it was supposed to do, quick and to the point, kinda pricey but in line with like products but was available when the others were not. After finding the Milwaukee brand of diamond hole saws and liking the quality I will purchase these from now on. Rated 1 out of 5 by Mindy from Do not buy this . it did not cut... Do not buy this . it did not cut through the tile and we wastes $36. We had to buy another one which was wonderful. Rated 4 out of 5 by GL from Worked well after several tests to learn how to get... Worked well after several tests to learn how to get started evenly in tile. Wished it had starter bit.